The protection of the environment is one of the fundamental, overriding drivers of the activated carbon industry, so it is no surprise that our products and services are widely used in the treatment of waste streams, to reduce the environmental impact of these processes.The incineration of municipal and industrial waste, at energy-from-waste (EfW or WtE) facilities, is becoming an increasingly significant treatment solution for non-recyclable waste, since it represents a better alternative to the landfilling of waste. Powdered activated carbon (PAC) is used in the flue gas treatment systems of these EfW facilities to remove traces of dioxins, furans and heavy metals such as mercury. 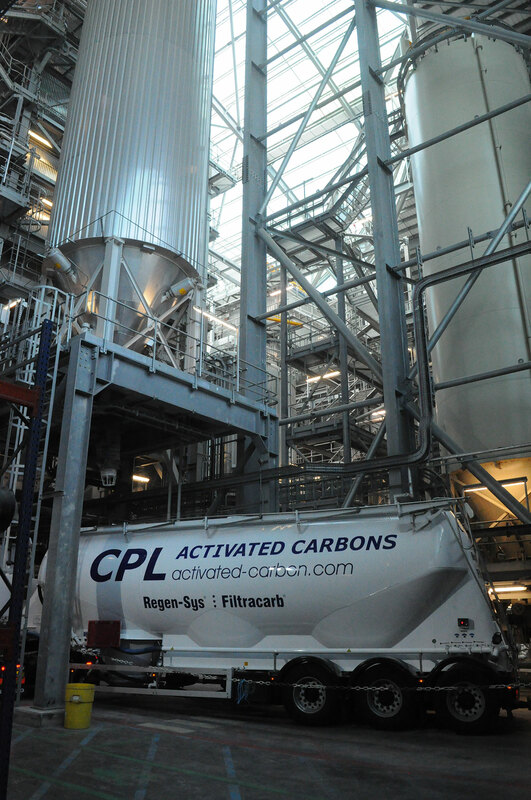 CPL Activated Carbons’ Filtracarb® FGT® range is recognised as the industry standard for flue gas treatment at EfW facilities, and we are a leading supplier of PAC materials into this sector. For the specialised incineration of medical waste, which may contain higher levels of mercury than standard municipal waste, we offer a PAC product impregnated with specific chemicals to boost the performance of the flue gas treatment system. Filtracarb® IPK-J is the grade we offer for this application. Aside from the incineration of waste, activated carbons find use in other areas of this industry, typically for odour control systems in waste handling/reception buildings and at IVC (in-vessel composting) facilities. The decomposition of waste at biogas facilities is also a potential source of nuisance odours, for which carbon filters are often the most convenient and cost-effective treatment solution. Our Site Services team are on hand to assist with the installation of the carbon/filter as well as removal/changeout when the carbon is spent. For VOC abatement and general air treatment, a standard extruded carbon pellet is usually selected. This can either be a virgin/new grade, such as Filtracarb® EX64, or our UK-made regenerated grade called EXR4, which offers considerable savings in terms of cost and carbon footprint. For the removal of sulfur-based nuisance odours, various impregnated carbons are available from CPL, including Filtracarb® SA70 and SA78. Our experienced commercial team can advise on the best solution for your particular process flow and treatment objective.